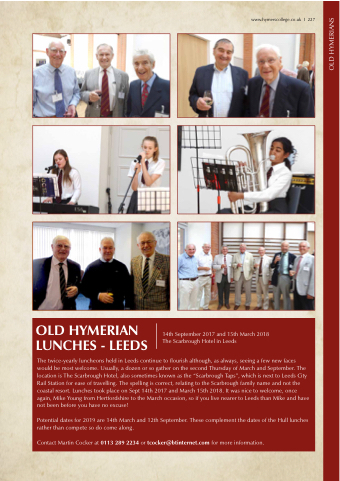 The twice-yearly luncheons held in Leeds continue to flourish although, as always, seeing a few new faces would be most welcome. Usually, a dozen or so gather on the second Thursday of March and September. The location is The Scarbrough Hotel, also sometimes known as the “Scarbrough Taps”, which is next to Leeds City Rail Station for ease of travelling. The spelling is correct, relating to the Scarbrough family name and not the coastal resort. Lunches took place on Sept 14th 2017 and March 15th 2018. It was nice to welcome, once again, Mike Young from Hertfordshire to the March occasion, so if you live nearer to Leeds than Mike and have not been before you have no excuse! Potential dates for 2019 are 14th March and 12th September. These complement the dates of the Hull lunches rather than compete so do come along. Contact Martin Cocker at 0113 289 2234 or tcocker@btinternet.com for more information.